TRIVIA of Noh : Q129 : Is it true the cypress stage floor is alive? | Home | Trivia | Q129 : Is it true the cypress stage floor is alive? Is it true the cypress stage floor is alive? The floor of the Noh stage is made up of boards of Japanese cypress, or Hinoki. It is easy to imagine that the cypress is still alive even long after the trees were logged. Respecting this, adjustments are made to optimize the condition of the stage. 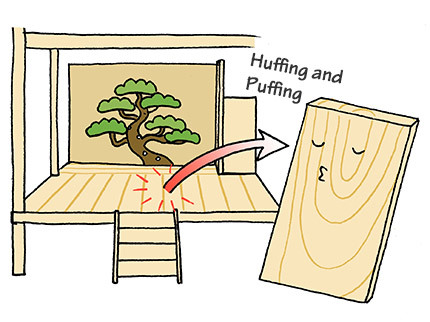 The stage floor of Kanze Noh Theatre in Tokyo uses several pieces of solid cypress timber and experts adjust the floor a couple of times a year. During the hot and humid weather of July and August, the floor boards expand and rise, so the experts remove cushioning materials at the jiutaiza and shift the boards to create gaps between them. In January and February, when the floor boards shrink again and the gaps become wider, the experts move the boards slightly toward the metsuke-bashira, or “eye-fixing pillar”, and insert cushioning materials at the jiutaiza.